Courtesy of 518 International Solidarity Blog: May 18 known as 518, is one of Gwangju’s most significant dates. The annual commemoration is a tradition that has been observed by the families of the victims which the government only instituted in 1995. It is also an important date for Gwangju citizens and the Korean public in bestowing honor and recognition to group or individuals by awarding the Gwangju Prize for Human Rights. For 2008 this award is given to Mr. Muneer Malik for his role in protecting the independence of Pakistan’s judiciary, defending its constitution and promoting human rights. Mr. Malik was the former President of the Pakistan Supreme Court Bar Association. He led the struggle in fighting against the attempt made by President Musharraf to oust the Chief Justice of the Supreme Court, in order to protect human rights and the independence of the judiciary. So on May 18, 2008, Mr. Malik was awarded the 2008 Gwangju Prize for Human Rights. The ceremony was graced by Mr. Kwangjang Yoon, Chairman of The May 18 Memorial Foundation; Mr. Youngmin Noh, a member of the Korean Parliament who read the citation of Mr. Malik; Mr. Kyunghwan An, Chairperson of the National human Rights Commission of Korea; and representative of Mr. Gwangtae Park, Mayor of Gwangju who read his congratulatory message. It was witnessed by the participants of the 2008 Gwangju International Peace Forum and the citizens of Gwangju. . The Asian Human Rights Commission wishes to inform you that at an award ceremony held at the Foreign Correspondent’s Club, Hong Kong , Mr. Muneer Malik accepted the Human Rights Defender Award on behalf of himself and his colleague, Mr. Aitaz Ahsan. Mr. John J. Clancey, the chairperson of the AHRC made the presentation speech on behalf of the AHRC and detailed the contribution of the lawyer’s movement of Pakistan to the cause of the rule of the law and the independence of the judiciary. He highlighted the importance of this movement and the courageous role played by about 3,000 lawyers who faced detention and the 60 judges who were dismissed from their positions. He also highlighted the important role played by the leading lawyers such as the two gentlemen who were honoured on this occasion who lead a whole generation of younger lawyers that went into the streets to defend the rule of law and the independence of the judiciary. The May 18 Memorial Foundation in Gwangju, Korea proclaimed Mr. Muneer A. Malik as the winner for the 2008 Gwangju Prize for Human Rights. Mr. Muneer A. Malik was the former President of the Supreme Court Bar Association who has played an enormous role in the struggle of the lawyers, judges and the rest of the citizens of Pakistan for the independence of the judiciary. Under his leadership he was able to mobilize lawyers and the people to fight the repression imposed by President Musharraf when he declared an emergency and ousted several chief justices and judges. In the 1980’s Mr. Malik had been in the forefront of the struggle against the military rule of then President Zia Ul Haq. Mr. Malik was recipient of the 2006 Dorab Patel Award given by the Human Rights Commission of Pakistan. On May 18, 2008 the award will be conferred to Mr. Muneer A. Malik on a ceremony to commemorate the May 18 Gwangju Democratic Uprising (Wikipedia: Gwangju Massacre). The prize award includes a gold medal, a certificate of achievement and US $ 50,000.00. At around 10:00 the judicial bus left the Sindh high court.bar on its way to Malir Bar reaching there at 10:30 where a big crowd of lawyers & activists were gathered. A press conference was held. From activists in Lahore: Can we let apathy and general fatigue have the best of us while the government continues its draconian orders? How long will Aitzaz Ahsan, Muneer Malik and Ali Kurd remain in arbitrary house arrest? Just Yesterday the Honorable CHIEF JUSTICE Iftikhar Chaudry was given illegal orders to VACATE his residence in a week or HE WILL BE EVICTED BY FORCE! Several citizens responded to a call made by People’s Resistance to hold a “get well soon” vigil in front of SIUT where Mr. Muneer Malik, former President Supreme Court Bar Association, is under treatment. Numbers started picking up quickly from a handful to about 25 people holding the vigil at any one time. One of the participants had his own brother admitted in the hospital and said that he wanted to join as “Mr. Muneer Malik was a brother to the entire nation” and he wanted to pray for his health along with the group standing there. Another lady, when asked why she was there replied that Quaid e Azam and his team created Pakistan and Mr. Muneer Malik and his friends were giving sacrifices to save it today. She said that holding this vigil was the least that she could do for today’s heroes. 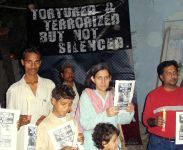 Candles were lit and the group stood silently with Mr. Muneer Malik’s pictures for over 3 hours. The vigil was held by a diverse group of people who came specially for this occasion. These included doctors, a professor, shopkeepers, IT professionals, a bus driver from interior Sindh and several unknown participants. The family of Mr. Muneer Malik came down to see the vigil from a distance and were concerned that the group may not enter the hospital to visit Mr. Muneer Malik who needs complete rest. Once they were assured the group had no intention to disturb Mr. Muneer Malik and were there only to give their “get well” wishes from a distance, the family was satisfied. 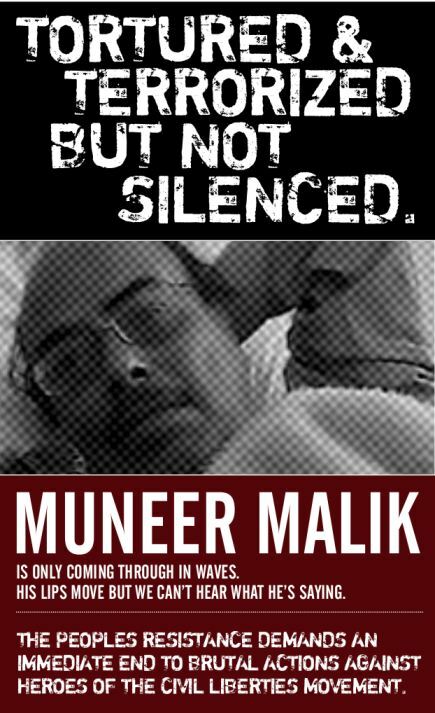 People’s Resistance would like to issue a call for a 6-hour vigil outside SIUT today 7th Dec for the quick recovery of Mr. Muneer Malik. Please show up in full force and share your concern for this great leader and his struggling medial condition. Muneer A Malik’s condition has suddenly deteriorated at the SIUT hospital in Karachi. Doctors are reviewing whether to send him abroad. Please join us in praying for a swift recovery. He is a titan – may God restore him to good health soon. As I write this from a sub-Jail, let me tell you how proud I am of each one of you and of myself to be part of the community that is writing the present chapter in the history of our unfortunate country. As you are all aware we the lawyers are the vanguard in this long over due mammoth battle for civil rights and democracy in our country. As for myself, jail is not new to me. I was first arrested as a one-year old in the arms of my mother when she courted arrest in 1946 after my father and grandfather had already done so in the Pakistan movement. During the Martial Law imposed by General Zia-ul-Haq I was arrested and detained without trial several times for long terms only because I pursued, even then, the ideals of democracy and an independent judiciary. Let me assure you that the sacrifices that you have given and the selfless courage that you have shown for a completely selfless cause of an independent judiciary and civilian rule have no parallel anywhere in the world, even in countries from which we have borrowed the concepts of the rule of law and judicial independence. By seeking the restoration of the Chief Justices and Judges of all provinces we are in fact seeking to the save and strengthen the Federation. Ours is a noble cause.